창녕 지방에 있는 옛집으로 안채·사랑채·대문간채로 구성되어 있으며, 이 중 안채만 지정되어 있다. 안채는 현소유자 하경목 씨의 18대 조상이 이 마을에 들어와 세종 7년(1425)에 지은 건물이라고 전해지고 있으나, 수리과정 중에 ‘건륭 25년’이라는 기록이 발견되어 이 때에 다시 지었거나 수리를 한 것으로 보인다. 안채는 중부 이남지방에서 일반적인 앞면 4칸·옆면 1칸의 '一'자형 홑집으로, 왼쪽부터 작은방·대청·큰방·부엌의 순서로 배치되어 있다. 길게 빠져나온 처마는 이 집의 가장 대표적인 특징이라고 할 수 있는데, 빠져나온 처마의 길이가 기둥의 높이에 가까울 정도로 깊다. 이는 일조량이 높은 남부지방의 기후적 특성을 고려한 것으로 여름날 최대한 햇볕이 집안으로 적게 들어오게 하기 위함이다. 또한, 지붕은 우리나라에서 일반적인 볏짚을 사용하여 만든 초가지붕과 달리 억새풀을 엮어 얹은 억새지붕으로 하였는데, 비가 올 경우 빗물이 지붕에 고이지 않고 곧바로 억새풀 줄기를 따라 흘러내리도록 하여 집안으로 비가 새는 것을 효과적으로 차단하고 있으며. 이로 인해 지붕의 수명도 일반 초가지붕보다 길다. 대청마루는 통나무를 윗부분만 편평히 깎고 아래는 껍질만 벗겨 그대로 깔았는데 이것은 민가에서 오래전부터 해오던 방식이다. 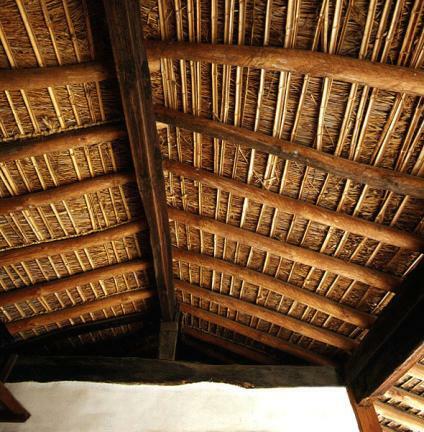 또한 목재는 못을 쓰지 않고 구멍을 뚫어 연결하였으며, 천장은 흙을 깔지 않은 상태로 구성하여 가볍게 한 점 등이 이 고택의 특징으로 이러한 점들은 중부 이남지방 살림집 연구의 중요한 자료로서 가치가 높다. 앞마당에는 작은 텃밭을 가꾸었고 부엌 앞쪽에는 장독대가 있으며, 안채 뒤로는 꽃계단을 꾸며 몇 그루의 오래된 나무들이 어울러 숲을 이루고 있다. 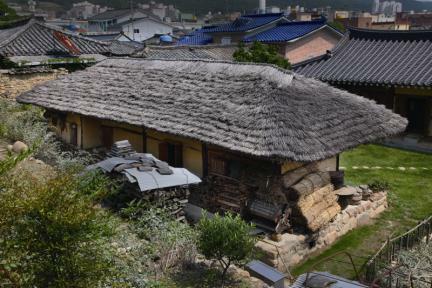 Located in the Changnyeong area, this house consists of the anchae (women's quarters), sarangchae (men's quarters), and munganchae (gate quarters). 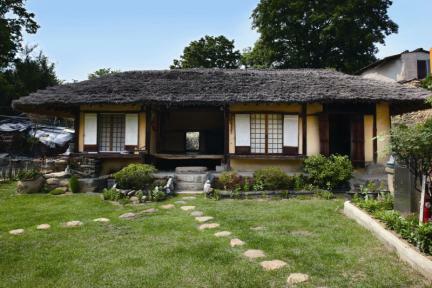 This house, which belongs to Ha Gyeong-mok, is said to have been originally built by the 18th generation of his family back in the 7th year of the reign of King Sejong of the Joseon Dynasty (1425). 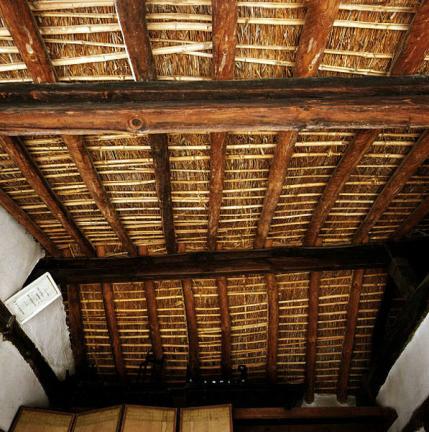 An inscription on one of the beams indicates that it was rebuilt or repaired in 1760, the 36th year of the reign of King Yeongjo of the Joseon Dynasty. 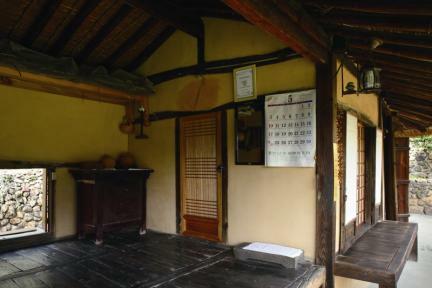 This house is arranged in “一” shape and it measures 4 kan (a unit of measurement referring to the distance between two columns) by 1 kan. From the left side, a small bedroom, the daecheong (wood-floored main hall), the master bedroom, and the kitchen are laid out in order. 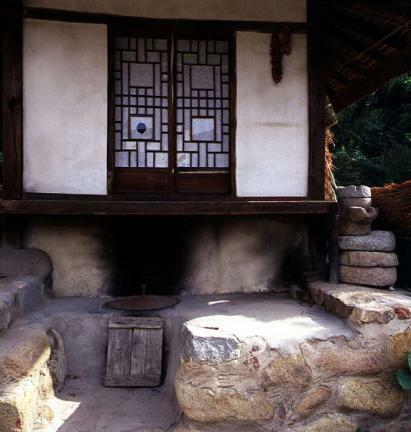 The daecheong is made of logs flattened on the top only. 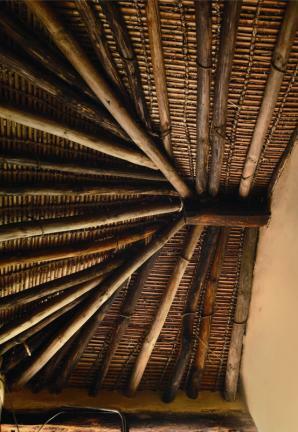 Wooden pegs instead of nails are used to join the rafters and beams. 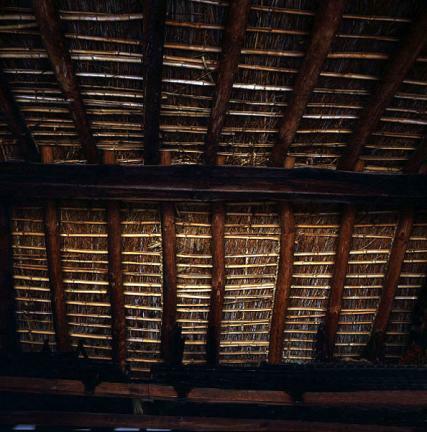 Although the roof is thatched in the traditional way, there is no layer of mud, which was usually inserted between the roof and the thatch for better insulation and light weight. 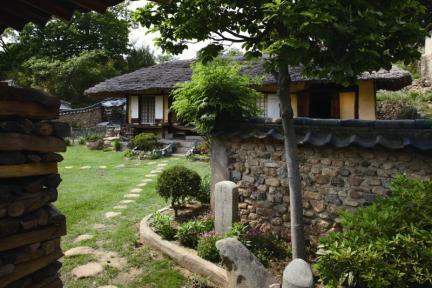 There are a vegetable garden in the yard, a terrace where soy sauce pots are placed in front of the kitchen, and a flower garden in the backyard. 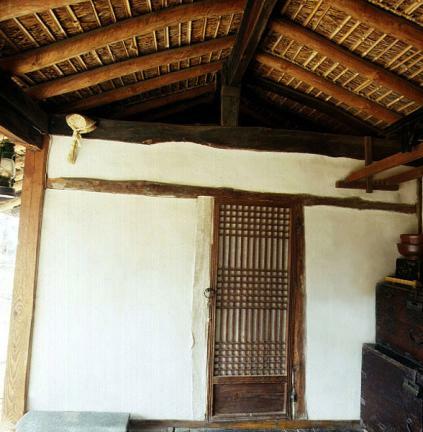 This is a typical house of an ordinary person in the Joseon Dynasty. 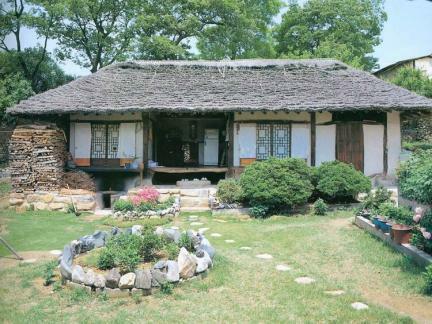 Suljeong-ri was named after a pavilion called “Suljeong,” which was built by County Magistrate of Changnyeong, Jeong Gu (pen-name: Hanggang). 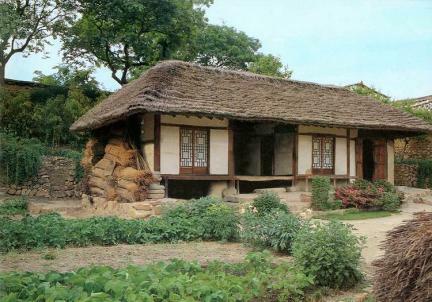 At the time of the house’s designation as a cultural heritage, the name of the house was “House of Ha Byeongsu in Changnyeong” but was changed to “Thatched-roof House of the Ha Clan in Suljeong-ri, Changnyeong” to reflect the name of the village (Suljeong-ri), residential history (Ha Clan), and type of house (Thatched-roof House) (Jan. 29, 2007). 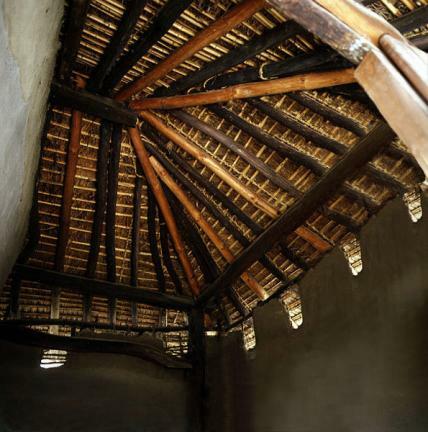 ※ Viewing of the aforesaid cultural property is usually available anytime but may be limited depending on the owner’s personal circumstances.